If you are into sub-genre of Vampire Romance then you have probably heard some talk of the Love At Stake series by Kerrelyn Sparks. These books have a wonderful sense of humor about them, all take place in one world, with a narrative that benefits from reading them in order, but does not demand it. Think of it as someone writing a book for each year of the history of a country, and in each book they focus on two different people living in the country during that year, and taking part in the major events. Do you have to know about the events of the previous year for the current events to make sense? Not really. But it does add depth and understanding. And because these are the “major figures” in those events, the leaders and their lieutenants and their families, people you have met in the books will often show up in subsequent books, those who were the leads in a book will be guest stars in a future book, or vice-versa. The series starts with How To Marry A Millionaire Vampire where the readers meet Roman Draganesti, a charismatic leader of the vampire world who happens to be a brilliant scientist who has, thankfully, invented synthetic blood. This invention is known throughout the mortal world as a scientific breakthrough that made blood-transfusions much easier, but of course for the Vampire community it was life-changing in an entirely different way. But that is the past, the present and future are what the story is all about, and as it unfolds he meets a woman the reader can not help but hope he can save, and love. Having established Roman, and his entourage of entertaining, and interesting characters, the series launches with a sequence of adventures and on-going plots that have kept me eagerly awaiting the release of each upcoming book. The only aspect that has begun to wear on me is the titles playing off of movie titles. Where many of them have been fun, and brought a smile to my face, a few have not tied into the plot as strongly as I might have liked and felt a bit unnecessary. These are such great books, I can not help but wonder what titles the author would be giving the books if she were not trying for those plays on words/titles. 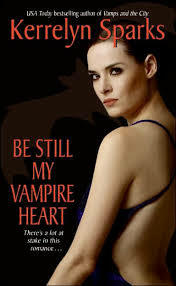 This entry was posted in Novel, Review and tagged A Very Vampy Christmas, All I Want For Christmas Is A Vampire, Be STill My Vampire Heart, Crouching Tiger Forbidden Vampire, Eat Prey Love, Forbidden NIghts With A Vampire, How To Marry A Millionaire Vampire, How To Seduce A Vampire, Kerrelyn Sparks, Love At Stake, PopArtsPlace, Roman Draganesti, Secret Life of A Vampire, Sexiest Vampire Alive, The Undead Next Door, The Vampire and the Virgin, Vampire Mine, Vampire With the Dragon Tattoo, Vampires Gone Wild, Vamps And The City, Wanted Undead or Alive, Wild About You on August 14, 2014 by A Novel Approach.